You think of the happiness of your loved ones always. Birthday is the most celebrated occasion worldwide. It is one of the days, when you gift your loved ones with wonderful gifts and surprises. 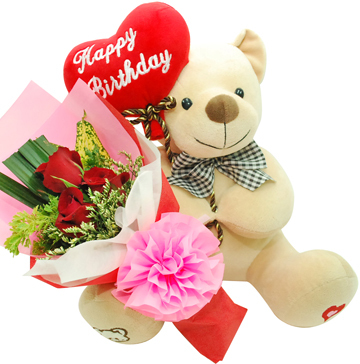 If you are looking for a birthday gift, then this lovely bunch of red roses adorned with seasonal fillers and big cute 1 to 1.5 feet tall teddy with a Happy Birthday inked heart is the perfect gift.